1. Choose whether to import the data to a new or existing matrix within Quantrix. • Create new matrix - this choice creates a new empty matrix containing the results of the DataLink import. • Use existing matrix - this choice prompts you to select an existing matrix into which to place the results of the DataLink import. • Include column - choose this option to include the column in the import. • Type - for any column you choose to include, choose a type from the 4 available types in the drop-down for each import column. The available types are Category, Group, Item and Descriptor. The Type defines how the data will be used in Quantrix. 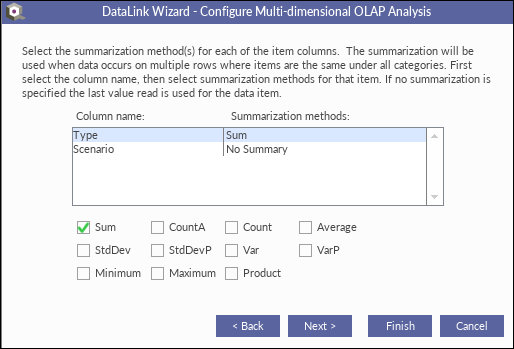 Type may initially default to Item: if you want to use Multidimensional OLAP, you must select some categories to serve as dimensions. Select Category if you want Quantrix to create a category for the column in Quantrix. The data will be brought in as item names. Select Group if the column represents groupings within an established category column in the data, and you want Quantrix to make the column a group (see Using Item Groups). The data will be brought in as group nodes in a category. For example, if you had a category for states, and a column for regions, you might make regions a group: the group for New England would "group" the states in New England. Select Item if the column represents a data-item, or measure, of your imported matrix. For example, if you have a column called "Population" that you identify as an Item, then Population data will be brought in as items in a Data Item Category. Select Descriptor if the column describes or labels an estab­lished category column in the data (see Using Item Descriptors). The data will be brought in as an item descriptor value associated with the items of a category. • Sort - If you select Category or Group for the Type of the column you can specify whether Quantrix should sort the items and in what order to sort them. If you do not specify a sort order, the items are created in the order they are found in the imported data. 4. If you are importing into an existing matrix, an additional column appears to the right of the Sort column called Existing category, in which you can specify existing categories to which to map the categories you are importing. If you are creating a new matrix, you do not see Existing category. If you are importing into an existing matrix, select the appropriate Category from the existing matrix to use for imported items using the drop-down. You can select New Category if desired. Category is the category from which the data items or measures will be created. 5. Select the Blank cells under a category assume previous value option if you want the DataLink to leave a cell that imports as blank with whatever value may have been there before. This is useful when importing from other applications that export data using that assumption. 6. Select the Suppress item category option to prevent the creation of a single data item category if there is only one (the option is enabled only where there is only 1 item column or none included in the import). If you select this option, no item category is added to the matrix; if you don't select this option, the item category is created with one data item in it. 7. Click Next > to continue. 8. For any groups listed on the left, select the column being imported from Groups items in Column that should be put in the Group name shown at the left. The columns available for selection include category and other group columns. A column that has already been grouped will not appear in the drop down. If all groups are assigned the Next button is enabled. For any Descriptors listed on the left, select the Descriptor Category (column) in the import. If you are importing into an existing matrix, use the Rendezvous Descriptor drop down to select existing item descriptors on that category to assign to an existing Item Descriptor in the model. If all descriptors are assigned a category, the Next button is enabled. 10. Select each numerical value column in the Column list and set the format to use. Tip: You can use this method to group data. For instance, if you specify YYYY-MM as a date format, Quantrix can group all of the date values by month. You can use the Extended formats to specify fiscal years and even bin values into customized bins. 11. Click Next > to continue. 12. When data rows map to the same set of items in a matrix, you may want to apply aggregation methods. Select each column name and then choose the summariza­tion method(s) to use for that column, if any. The Summarization methods section updates to show the summarization method chosen for each column. If no summarization method is chosen, the last instance of the imported data populates the cell values. The default summary is sum for double and integer data types, and No Summary for other data types. In the case of No Summary, only the first value is used. Tip: you can select multiple summarization methods if desired. 13. Click Next > to continue. You may see a wizard page to specify how to handle categories that are not otherwise configured in the DataLink, but that exist in the matrix. For each Category Name shown, you can choose to insert data on subsequent updates into a new item on the un-referenced dimensions, or to a specific item that already exists, by selecting a choice in the drop-down from Insert Data In. 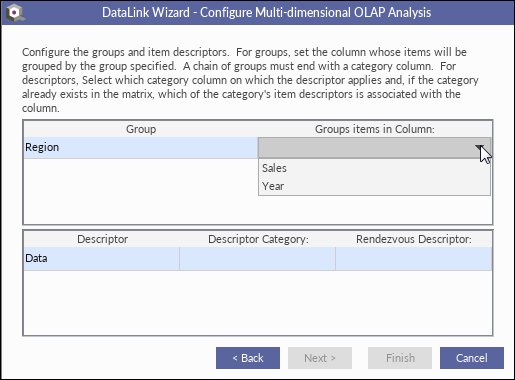 Select Create new category with new item for data to have the DataLink automatically create a new category specifically to accumulate updates. In successive updates of a DataLink, for example, the first import would be Import 1, the second update will be Import 2, and so on. Select Remove previously imported category items and data not present in update option if you would like DataLink to remove category items and data items if those items don't exist in the update. This option is useful if you want to essentially synchronize the data in the matrix with the data in the latest update. If you leave this option deselected, the items that don't exist in the update are not removed from the matrix. 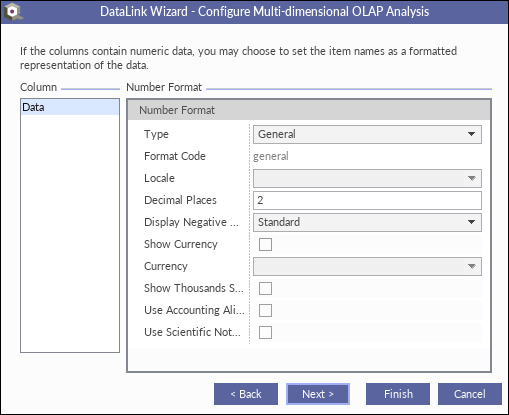 Click Finish to complete the DataLink for multidimensional analysis. Tip: If the data doesn't display, check the setting in View > Hide Empty Rows and Columns. Keep in mind the following considerations if the data source changes considerably. New columns that are added to a data source are ignored unless you tell the DataLink to include them: you must use Edit DataLink and add them to include them. 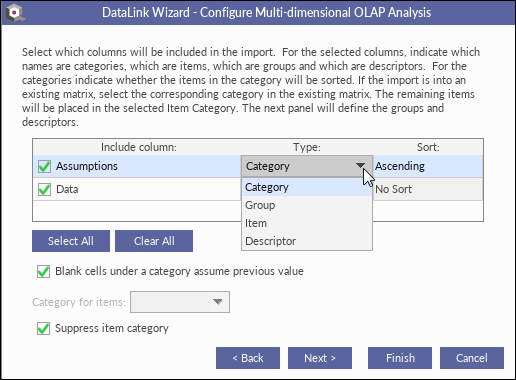 Columns that were removed from the data source are handled according to your selections within DataLink: If "Remove previously imported..." is selected, the Category items are removed; if all data items are removed, the Data Item category is also removed. If "Remove previously imported..." is not selected, the Category items that are no longer present in the data source remain in the matrix. Items you add to DataLink categories should never be removed, and the data should never be changed. Data that is associated with those items can be deleted provided the corresponding DataLink category items are removed by the update.